SEG - Silicone Edge Graphics | What is it and Why is it Better? Today, signage options are endless — whether it's for outfitting a trade show booth or promoting a retail store. There are many factors to keep in mind, but the most important thing is standing out. Everyone wants to be the loudest, but how can you ensure you get the attention you deserve in the fast-paced advertising environment we live in? Choosing a signage option that is contemporary and forward-thinking is a good start. Here’s where silicone edge graphics (SEG) come in. What are SEG graphics though? Think seamless, think bold, and think modern. These graphics are essentially borderless, designed to be all picture and no frame. SEG graphics are produced with photographic-quality printing, making your signage POP. After reading this article, you’ll wonder why you waited so long to add SEG graphics to your promotional arsenal. How do SEG Graphics Work? Silicone edge graphics (SEG) are printed on special tension fabric using a high-resolution dye-sublimated printing method. The product is edged with a thin silicone strip which is sewn directly into the graphic. These graphic displays have special frames with thin, flexible strips that act as recessed grooves. The graphics are designed to be pressed into the frame's extrusions — which creates the continuous looking appearance. The fabric itself must be the right size to generate the taut, drum-tight appearance when being worked into the frame. This action leaves a bold, seamless looking display, and is what sets SEG graphics apart from other backdrops and banners being sold on the market today. What are the Benefits of Choosing SEG Graphics? When you choose SEG, you choose a high-quality material, a sleek, borderless, wrinkle-free display, and signage that can be seen from all angles. Each graphic is glare-free and produced using the most vibrant, bold printing process available. Dye-sublimation printing produces photo-quality imagery — something you can’t find with vinyl printing. With “dye-sub”, you’re getting the best of both worlds. Bask in the vivid color from silk screening and the photographic quality of digital printing. The dye-sublimation process uses heat to transfer ink directly into the material so it becomes a part of the graphic itself. "Dye-sub" gives the finished product a bold, vibrant, and fade-resistant image that will last for years. Why Choose SEG Over Other Graphics Options? As a customer, you’ll want to make sure you’re investing in something worth your while, especially if it’s a representation of yourself or your business! With SEG graphics, you’ll be able to put on a cutting-edge presentation that’s bound to make you stand out. Customers will have a modern display and a clean-looking appearance, one that has a frameless façade. SEG graphics are lightweight and easy to install/breakdown for trade shows and events. These are qualities loved by convention attendees. The fact that these these graphics are easy to travel with doesn't hurt either! Unlike vinyl displays, SEG graphics can fold up like a piece of clothing — which is far less of a hassle. This sleek-looking signage also features more graphic area for your buck being a borderless display. What Types of Displays Incorporate SEG Graphics? The beauty of SEG graphics is they can be created with almost any type of aluminum extrusion, which is why they’re so versatile. The versatility feature really opens up the design options for customers, because they're able to create a presentation that fits their needs. Choose from large backdrops, portable counters, and tabletop displays that are great for trade shows and expo events. Some units are even available with LED lights to really make your display pop. Smaller poster displays are essential for retail store settings to showcase products or upcoming sales — especially with the photo-quality image reproduction that the dye sublimation printing method provides. So, what do you think? SEG graphics are the modern signage solution you're looking for! We know you'll love the finished product and the detailed photo-quality of the dye-sublimation printing process. With a seamless appearance and bold imagery, there's no reason why you shouldn't invest in SEG graphics for your business or an upcoming trade show event. 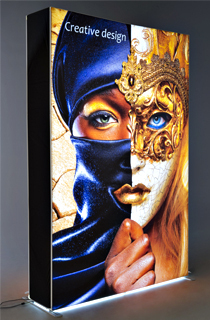 Let silicone edge graphics help tell your story and create the display you've been dreaming of!